We envision a Seattle where 1 in 10 trips is by bike. 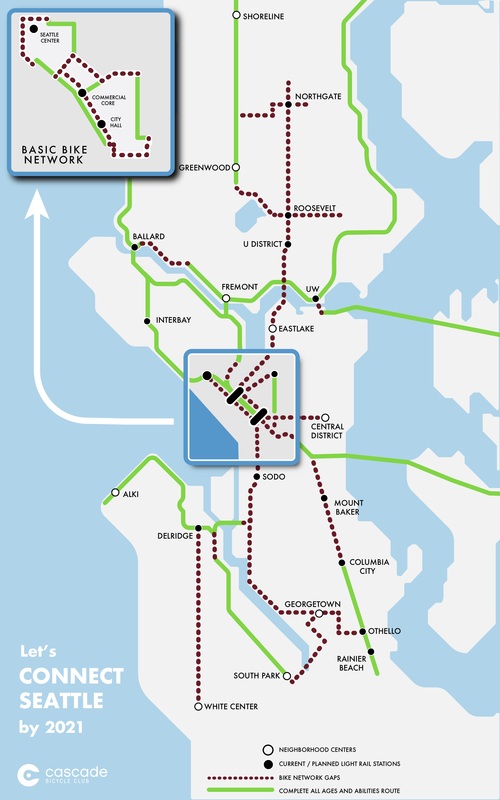 Here's the plan to get there: CONNECT SEATTLE. As more Seattleites look for fast, affordable transportation options, we envision a Seattle where 1 in 10 trips is made by bike. Making that vision a reality isn’t about hitting a magic number. It’s about creating happier, healthier and more inclusive neighborhoods – connected by bike – all across Seattle. We envision a Seattle where everyone, regardless of how we look or where we live, has the choice to hop on a bike to get to the store, to commute to school or work, or to cross town to visit friends and family for dinner. 1 in 10 trips by bike isn’t just an aspirational goal. a path towards 1 in 10 trips by bike: Connect Seattle. Here’s what it means: If Seattle follows through on a handful of projects that are already in the works – and completes them over the next three years – we’ll have a basic network of bikeways across the city by 2021. When we Connect Seattle, we connect people to the places they need and want to go by bike. And that means more people, taking more trips by bike. 60% of Seattleites want to bike more – and say that they would, if there were safe places to do so (1). When cities build protected, connected networks of bikeways, usage multiplies (3). We only need to look to comparable cities (with similar topography, weather, size, and density) to see that setting goals and methodically building connected bikeways create results. In 2009, Vancouver, BC, set goals to increase walking biking and transit. In less than 10 years, biking levels have gone from approximately what they are in Seattle to now over 10% of all trips (4). The majority of people identify as “interested but concerned” – they will only ride on a bike with physical separation, or on low traffic, low stress streets (2). Evolutions in bicycling, such as e-bikes, make bicycling accessible to more people for more trips. According to 2018 data, average e-bike trip length is 9.3 miles; top reason for e-bike trip was to replace a car trip; e-bike users find they overcome the biggest conventional bike barriers – hills (5). Get involved with making one of the projects reality: contact us to get plugged in. Join us to gain advocacy skills so you can enact the change we want to see.